From the 1980s there has been a spectacular growth in both the number of New Zealand vineyards and the international quality of the wine. While the early growth of the New Zealand wine industry was in the North Island, much of the more recent expansion has been in the south, notably Marlborough with its sauvignon blanc wines. And by 2002 Central Otago had 45 wineries, with the largest areas in pinot noir. 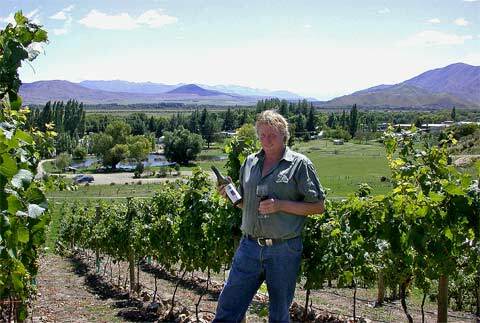 In 2004 two new pinot noir vintages appeared in the Waitaki Valley. One was produced by Brian Gilbert, who is shown in front of his vineyard, Clay Cliffs.